I recently had the opportunity to shoot with Canon’s new EOS C300 camera for a couple of days, and on top of that, I was able to shoot with it alongside a bunch of 5D Mark II’s in a demanding and fast-paced environment; a wedding! That allowed me to compare all the big talking points of the C300, including high ISO’s, form factor, audio, peaking/zebras/waveforms, size and weight, functionality and quite simply how easy it is to learn and use. So to get a few of the more obvious things out of the way, in comparison to the 5D’s the C300 was the bigger, bulkier and ultimately more exhausting camera to use on the day. The 9kg tripod I was using with it didn’t help of course! and in fact, the C300 felt well balanced in my hand for any hand-held stuff, and equally as useable and sturdy on a monopod. But, all those features that the 5D is missing really came into their own and outweighed the slight weight/bulk disadvantage. Considering I’d only had around 3-4 hours experience with the camera before the ‘big day’ too, the buttons were surprisingly intuitive and easy to learn. To put my use of the C300 into perspective, it was a 15 hour day from 9am ‘til midnight, shooting almost continuously throughout. As an overall evaluation of the camera it’s useful features such as peaking, zebras and waveforms really, really impressed me, along with all the other things that the camera has been getting so much praise for; the high ISO is as staggeringly clean as people have said. Also, coupled with the built in ND’s, there was rarely a situation where I had to compromise my shot in any way. I could choose my aperture and my ISO to suit any and all situations; If I wanted my shot to be really shallow in bright sunshine, 3 clicks on the ND+ button and I was ready to go (with a DSLR I’d then be fumbling around in my kit bag for my fader ND and the right step-up ring.) In this sense it’s a much faster camera to shoot run-and-gun with. The peaking feature in particular was just a dream to use when doing focus pulls and needing to reframe and re-focus every few minutes. The zebras remained on almost all of the time, although sometimes I did find that they disagree with what the screen is showing you. It still seems odd to me that there would be zebras over a wall or object that I could clearly see colour and detail in – basically to the eye it doesn’t look blown out at all, but the zebras told me otherwise. On top of that, on the first day, the screen was set to +2 sharpening and slightly darker than the image actually was, meaning that what I thought was sharp and exposed correctly, was often not quite as sharp and slightly overexposed. However, by day two (the wedding day itself) these issues had been addressed and the screen was showing much more accurately what I was shooting. The only negative points I could find with the camera were with the some of the buttons and the camera’s form factor. The default settings for some of the functions seem a little oddly placed and required some customizing to make them faster to change when shooting run and gun. The form factor of the camera also made it quite difficult to shoot anything particularly high up, because once it’s on a tripod at full extension, the viewfinder, and even more so the screen, are a good 2 feet from your face! It meant that at times I was struggling to see exactly what I was shooting. There is of course a million and one different ways to configure the screen layout – it can be up top or flipped down and round to sit lower and more side-by-side with the camera body – but it still remains a long way from view if you’re shooting on a tall tripod over people’s heads! In terms of the camera’s weight and size, it was actually a lot more portable and easy to get around quickly than I had first imagined. With a Canon 24-70mm L lens on the front the camera it was around 3kg or so, which is still very light and actually a more solid weight to eradicate shakes. On a DSLR, where the weight of your camera rarely exceeds 2kg, those shakes creep in when you’re handheld because firstly DSLR’s aren’t particularly comfortable to shoot with handheld and also because there’s not a lot of weight in your hands either. 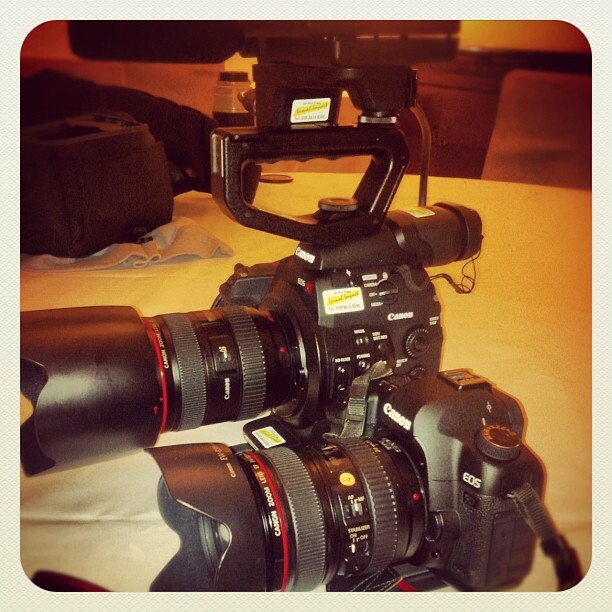 The C300 felt like a really solid, sturdy camera to be filming with. 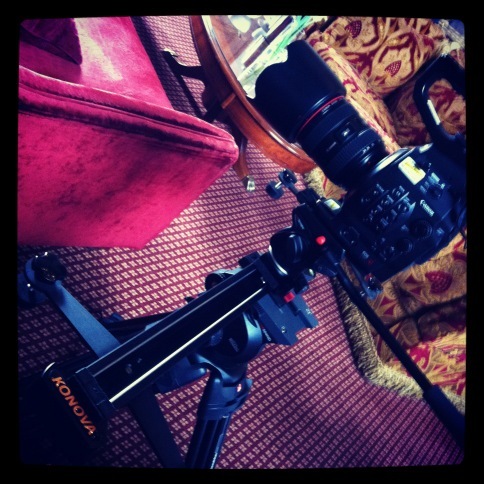 I used it on a Manfrotto 504 tripod and a Konova slider, and the C300 felt like a well-matched camera for these supports. It was a heavy set-up to move from place to place but I got some great stuff with it because of how secure and solid it all felt. And for all it’s quirky little features, design, weight and many, many buttons, it all seems irrelevant when you see the image quality. The resolution and colour depth of the image that I got out of the C300 were just stunning. The information in the image means that grading will be a doddle and the sheer detail at all apertures is excellent. It’s a camera that I managed to learn in a matter of hours, and felt confident and able to use without even thinking by the end of the first day. Buttons and menus are so easy to navigate and the possibilities with the “proper video camera” features made it a firm favourite of mine already. It’s just over a year since I bought my Canon 60D and it has been an eventful year for me, going from TV company intern to fully-fledged freelance and self-employed DSLR fanatic. I’ve had a go at almost everything; music videos, short films, corporate videos and most recently, timelapse. This is my first showreel, a collection of shots and scenes I contributed to on 20+ projects in 2011. Enjoy!